Here's my card for the current sketch at CAS(e) this Sketch. I created a mostly monochromatic card featuring a beautiful butterfly image from The Stamp Market. 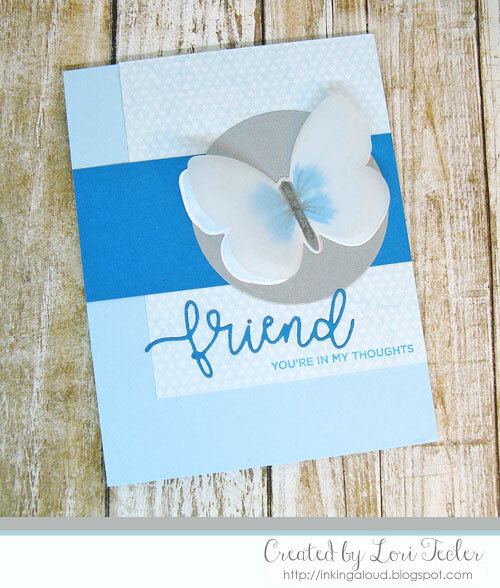 The butterfly from the Papillon set was stamped in blue and black inks, then die cut with the matching die. To get a dimensional look, I die cut the butterfly shape a second time, this time from vellum. I layered the two die cuts, attaching them at the center (body) only and folding the vellum wings up. So pretty! I adhered the butterfly to a silver circle. For the background, I adhered a blue patterned paper panel on a light blue card base, then added a darker blue cardstock strip on top. The colors are a pretty close match to those I used on the butterfly image. The round image panel was positioned over the darker blue cardstock strip. The sentiment combines a die cut word (friend from the Scripty Hello die set) with a stamped phrase (from the Hello Hello) stamp set. What a beautiful card Lori! Love all of the beautiful shades of blue!